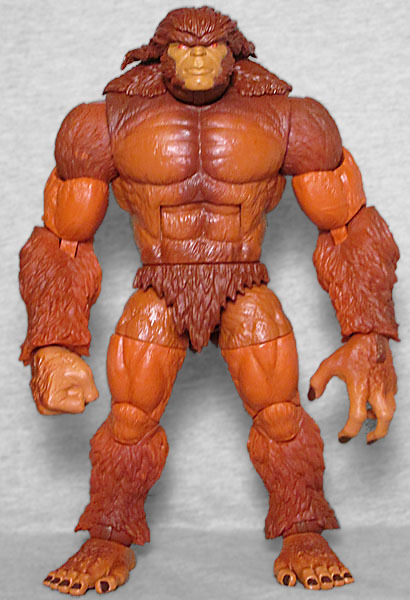 In 1998, ToyBiz released a figure of Alpha Flight's team muscle, Sasquatch. The next year, they reused most of the molds to create Man-Thing. Hopefully whatever designer came up with that bright idea gets royalties, because these days it seems you can't release one without soon releasing the other, whether they share any parts or not. Dr. Walter Langkowski was content with his quiet, fairly normal life as a college physics professor. That was before his insatiable curiosity regarding the effects of gamma radiation upon the human body led him to accidentally transform himself into the mighty Sasquatch! Standing at nearly ten feet tall, covered with orange fur and able to lift nearly 70 tons, Sasquatch is a physical powerhouse of superhuman strength. Sasquatch serves Canada as a member of it foremost group of super heroes: Alpha Flight. Alpha Flight fights to protect Canada and the world from the forces of evil. Sasquatch is the Build-A-Figure for the first series of Deadpool Marvel Legends, presumably because... they're both Canadian? Yes, they have interacted before (Walt is right there on the cover of Deadpool #1), but Sasquatch isn't as strongly connected to Deadpool as every other character in this series is. But hey, buy them all (or, six of them, at least - you don't need to get Classic Deadpool) and you can build the complete wood ape. 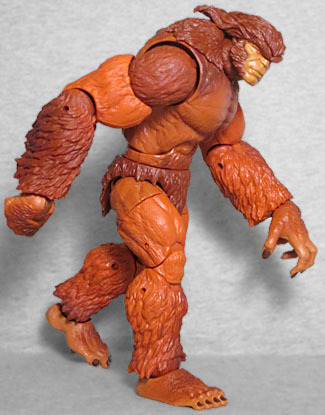 ToyBiz's Sasquatch was, for a time, the tallest Marvel Legend around, but height was all he had going for him: he was tall, but gangly, while this new version really delivers the bulk! He's shorter (coming in below 8⅜"), but a lot wider. The limbs are thick enough that he looks like he'd be able to pull a tree straight out of the ground to clobber someone with. The sculpt isn't as all-over furry as the one Phil Ramirez did for ML12, with the texture getting down to almost skin-smooth on the chest, biceps, and thighs. Are they planning to reuse this mold at some point? He still has extra fur around his groin, like a He-Man character, but the coolest touch has to be his feet: they look excellently simian, with thumbs sticking off the sides rather than just being normal feet with longer toenails. The face is great, too. The last Sasquatch was very angry, with his mouth open wide, while this one is looking more stoic. He still gets the traditional unibrow, with the fur running back from that to blend right onto his shoulders (which also get their own add-on fur piece). He has sideburns that would make Wolverine jealous, and a dimple in his chin that must drive the ladies wild! 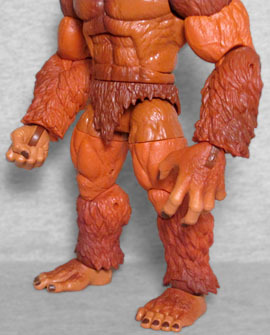 This is the original orange version of Sasquatch, not the later white version - look for that in an SDCC set or something, maybe. Or, hey, maybe they're planning to turn this body into the Wendigo! Anyway, there are at least four different shades used to color the figure's fur, but the fact that he's a BAF means the shades don't always line up on opposite sides of a joint. The legs, for instance, change color at the thigh swivel, so it almost looks like he's wearing shorts. The upper arms seem to lack any of the shading the rest of the arm gets. His skin is pale orange with dark brown nails, and his eyes are red. The wrist hinges are way darker than anything around them, though. 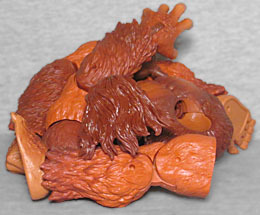 Sasquatch has swivel/hinge ankles, double-hinged knees, swivel thighs, balljointed hips, a swivel waist, hinged torso, swivel/hinge wrists, hinged elbows, swivel biceps, swivel/hinge shoulders, and a swivel/hinged neck. This time you don't have to make him hunch over to look right, although you can if you want. The chest hinge doesn't quite "click" between positions the way you might expect, but it's not exactly flopping around loosely, either. 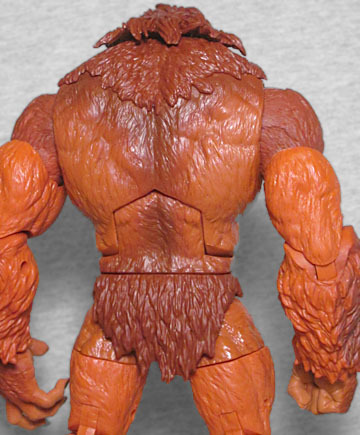 For a Deadpool series, Sasquatch isn't the most obvious BAF. But really, who else could they have done? T-Ray? Nobody knows or cares who that is. Deadpool doesn't hang out with a lot of really huge characters (though he did briefly date the Great Lakes Avengers' Big Bertha), and short of making an entire series of Alpha Flight, it's not like there's any other series where Sasquatch would make more sense. So if he's only here because he's Canadian? We can deal with that.